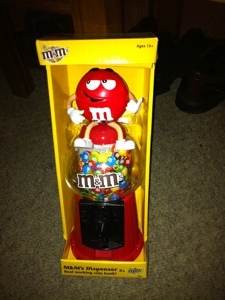 Now I’m in favour of age restrictions and think they are necessary to protect the young, but what is it about an M and M dispenser (complete with M and M’s) that makes it unsuitable for an eleven year old? If anyone knows, I’d love you to tell me as I’m completely baffled! I’d seen many like this before, but never this one. 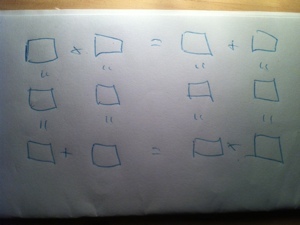 The task is to fill the middle boxes with numbers between one and nine with no repeats so that all the equations hold true. The young puzzlemaster was impressed that I solved it, as were his audience, but we left the rest of them trying for a while before he let them know the solution. Needless to say, that’s starters sorted out for each classes first lesson back after Christmas! I like it when I can run starters across all classes like this, i like to ponder who will be quickest to solve. Last year I ran this which came from my favourite maths teaching blog, and was pleasantly surprised to find the winner was from year 7! (he even beat all the staff!) it was made particularly fun by the fact his brother, who is on course for an A in year 13, took 3 times as long to solve it! Look at these beauties! These puzzle cubes have been bought for a dual purpose, firstly, I’m a bit of a geek and really enjoy doing this sort of puzzle (my HoD often calls me “the department’s resident geek”), but secondly, I think there could be a lot of mileage out of them in lessons. They would work well as a kinaesthetic activity, perhaps as a starter, and I’m sure there are other links to be had (any ideas welcome). I have completed the “barrel puzzle” and one of the “Marble Cubes” already, and both were good fun. 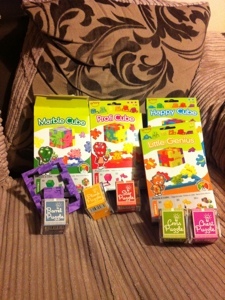 There are a variety of sets, each differing in difficulty, to aid differentiation, and you can own your own set by visiting http://www.happypuzzle.co.uk/ . I intend to investigate more into the possibilities these cool toys offer over Christmas, and I will post again about any more ideas I have. The last day, not of the world as we had been led to believe by the “oh it’s the apocalypse, it must be as the Mayan calendar runs out” crowd, but of the term. As a member of the staff band it meant attending the end of four rewards assemblies to play a few songs and generate a party atmosphere. This was superb fun, and I think has shown me in a different light to some pupils, and has meant that even pupils who didn’t really know me before now know who I am. I felt a bit famous at break time being mobbed by the year 7 and 8 kids, and have even been asked by a year 8 band if I will play bass for them in an assembly…. The assemblies were great, celebrating the pupils achievements and talents. The star of the show was a girl from my year 8 class, she is a superstar with a tremendous voice and she performed “an ordinary fool”, which was from her role as Blousy Brown in the recent production of Bugsy Malone. The highlight if my day was seeing a theatre full of the entire of year 9 and 10 (think 350 “Kevin and Perry”‘s) sit silent and open mouthed in awe of the performance, then give her an ovation befitting of The Rolling Stones at wembley! I nominated one of my year 11s for a special commendation award as he’s been working superbly well this year. It wasn’t exactly good for his street cred though, and he was a little embarrassed! Still, his parents will be proud when he takes it home, and hopefully that will give him a lift. Talking to my year 11s today has made me think about their leavers assembly. I have a real bond with the class, having taken over them in June 2011 when I joined the school. They were renowned around school as a troublesome class, but I have built an excellent relationship with them. They are a lower ability set, and so none of them will be doing a level maths next year. This means that even the ones that stay on are unlikely to find themselves in my class again. This will be the first class that I’ve had that will have left and I will miss them immensely. I just hope they leave with the grades they want. And breathe, well almost…. There is still a half day tomorrow, but that includes two of my four non-contact periods and for the latter part of the two lessons I am teaching, I will be covered so I can join the staff band and play in assembly. For the other parts of the lessons I will have some Christ-maths activities. I’m not sure which ones yet, I have a variety. The early part of this term was tough. Having passed the NQT year last year I had to make the jump to a full timetable in September, a full timetable that quickly became a “more than full” timetable when things were shifted round to allow our three finest year 13 pupils to pick up an extra AS level in further maths. I was happy to take on the extra work, as further maths is so much fun and the three lads in question are a pleasure to teach. However, coupled with a not much older than newborn baby at home, I was discovering new levels of tired. This was challenging, but it was a challenge I enjoyed and relished. By half term I had configured a way of working that meant I was getting everything done that I needed to do, planning and teaching engaging lessons and keeping my working week down to a manageable 50 hours (mostly), giving me enough time to enjoy all the things that come with being a new parent. During the first half term I was observed by the new head of school. I was judged good with outstanding for a lesson on substitution with my low ability year sevens. They are a fairly challenging class and the judgement made me feel particularly good as it was exactly the lesson I would have taught even if I wasn’t being observed. I don’t like to change the way I teach for observations (although I think the nerves/adrenaline that go with it mean I probably change slightly). I think that if a teacher is doing something totally different in observations than in their normal lessons then they need to look at their normal lessons and try to bring them up to standard. I try to ensure that all my lessons are planned to the standard I would want in an observation, and I think we all should strive to this. (Obviously the in class mocks etc don’t count!) The only difference was that I typed up my plan onto a school proforma, rather than making hand written notes in my planner. Half term came and went, and my timetable was slightly rejigged, meaning that it is now only a full timetable. This coupled with the fact I have gotten used to a full timetable has made my workload seem quite a lot less, although, in actuality I am putting in the exact same amount of hours. My year 11s have found a new sense of self-motivation, probably brought on by the fact they have been investigating 6th form/college/apprenticeship options which invariable hit home the importance of maths. This has meant that getting homework back in has become a much easier task. I’m not sure whether to be worried that my year 8’s believed me when I told them that I intended to spend Christmas day solving equations….. This week our SOW has a series of Christ-maths projects built into it for KS3. They are more functional based and are there with the goal of building independence early so the new functional style GCSE questions aren’t a complete surprise once they get further up the school. Many pupils seem to have come from primary school with a real reliance on spoon feeding, so getting them to think for themselves around the project has been good. I found it rather interesting that the most intelligent pupils tried to find shortcuts through the tasks, which actually led to some real deep mathematical thinking and probably meant they gained even more from the sessions than those who followed the more obvious route. The projects we used came from http://www.functionalmathematics.co.uk/ and were pretty good. Although I think I will rejig them a little next time I use it, include more scaffolding for the weaker classes and design a more stretching extension for the more able ones.